Digital Factory Apparel Brother Edition. 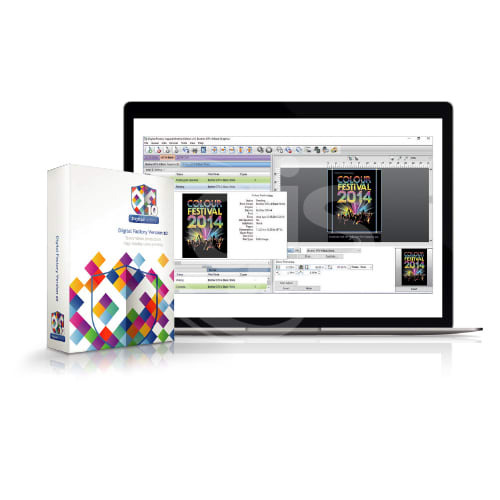 Specifically designed to leverage the advanced print capabilities of Brother DTG printers. Digital Factory Apparel Brother Edition provides professional quality workflow and colour management tools. Designed specifically for Brother GTX and GT-3 direct to garment printers, this version of Digital Factory Apparel includes features that enhance colour reproduction and maximize productivity. Spectacular Colour Reproduction - CADlink’s high-fidelity colour management engine provides the most vibrant, colour-accurate printing on white, coloured and black fabrics. Industry-leading white ink management and automated underbase feature - Proper use of white ink is essential to printing images onto black or dark coloured fabrics. Advanced implementation of layer technology automatically creates an underbase layer that can be sent to a production queue directly from a design application. Unmatched integration of black artwork elements into black garments - A pre-set queue function can automatically remove any black components from a design when printed on a black fabric. This creates highly attractive prints that make designs appear to literally “blend” into the fabric, (see also “plug-in” description below). Seamless interface with design applications - No need to worry about the issues involved with exporting and importing files. Digital Factory Apparel uses “send to” technology direct from your favourite design applications, (Corel, Illustrator, Photoshop). Complete, centralized job management - CADlink direct to garment RIP software features Visual Production Manager™, a simple, easy to use interface that manages multiple queues and multiple printers simultaneously. Precision ink level controls - Provides the ability to optimize amount of ink placed on different fabrics. 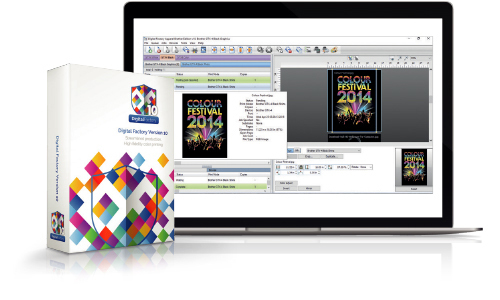 Contributes to cost savings and increases print quality. CMYK and RGB file colour support ensures the widest range of process colours and true photographic-quality image printing - Conversion of colour spaces (RGB to CMYK) can create unwanted colour shifts. Since most apparel printers work with CMYK, Digital Factory Apparel is able to provide the most sought-after colour results in the market. Great Support, never wait long for an answer. Always helpful. Even offered to replace a mug that arrived broken even though they don't have to. Thanks for your assistance in your own time. We are always impressed with GJS´ customer service, it is much appreciated.